The NFIB is the state’s leading small-business association and recognized several members of the General Assembly who achieved a 100 percent voting record on key small business issues in the current legislative session. 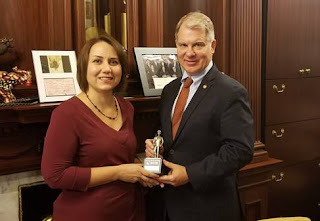 In response to receiving this award, Senator Argall stated “I am honored to once again be named a Guardian of Small Business. As public officials, we have an obligation to create a job-friendly environment here in the Commonwealth. Small businesses are responsible for employing half of the workers in the United States and by building up our many local small businesses, we can encourage more economic and population growth across Berks and Schuylkill counties”. A 100 percent score indicates that Senator Argall voted in favor of small businesses and independently-owned companies every time an important vote was taken during the 2017-2018 legislative session. The Guardian of Small Business Award is the most prestigious honor that the NFIB bestows on legislators. PHOTO CAPTION: Rebecca Oyler, Legislative Director of NFIB Pennsylvania, presents Senator David G. Argall (R-Schuylkill/Berks) with the Guardian of Small Business award at the state Capitol.